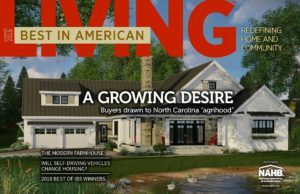 Now in its 33rd year, the Best in American Living Awards (BALA) is an established national awards program recognizing residential design excellence in both homes and communities. Winners of the Best in American Living Awards are at the forefront of innovative design and provide a preview of design trends to come over the next several years. Let’s take a look at some of the top regional trends showcased in this year’s BALA winners, starting with the Midwest. Refreshingly Chic of Holland, Mich. features Trend #1, a hidden pantry which makes for a clutter free kitchen zone. Opting for warmth and light, this kitchen now sparkles among clean lines and cool hues. Starting with a perfect balance of classic and contemporary, fresh white cabinetry coordinates with a quartz island countertop sporting an oversized mitered edge, while a black soapstone perimeter lends a defining touch. Overhead, the wood beams accentuate the upset ceiling treatment and blend with the home’s existing details. Antique glass inserts and coordinating soapstone countertops on the inside add thoughtful design touches and represent the discerning care around every corner. The Rookwood Baron Room of Grand Rapids, Mich. represents Trend #2, dark woods. Here, rich Gaboon ebony mixed with burled walnut paneling and coffered ceilings adorn the Baron Room’s three separate spaces, the Tasting Room, Bistro, and Library. Artfully contrasting the paneling in the Bistro are white marble tabletops, plush blue velvet bench seating, vibrant brass fixtures, and leather-wrapped pub chairs. In the library, Moroccan tile frames a grand fireplace that is fit for the wood barons of decades long since passed. Kitchen as a gathering space is Trend #3, shown here in Authentic Charm, Grand Rapids, Mich.
Imbued with a sense of rustic and warm flair, this extensive renovation including a kitchen, hearth room, butlers pantry, and dining nook, which has resulted in a cohesive design with functional workspace and floor-to-ceiling storage. Among the main objectives of this project were to unify the space with the remaining elements of the home, maximize the views, and create a destination for friends and family to gather. Thinking about the home in its entirety–moldings, trim, ceiling beams, columns, and openings–allowed these elements to be integrated within the new design, ensuring a cohesive sense throughout the entire home. Next week, we’ll look at the North Atlantic!